I shouldn't say I've been too busy to blog... lots of you have much more going on than I (enter: spouse to appease, children to play with / take care of, jobs with serious amounts of travel involved). So, if busy can't be my excuse... I guess that leaves motivation and desire to write. Luckily, after spending MANY many hours in rehab, my motivation and desire to train/race came right back. Heck, I don't think that ever really escaped my being... Actually, with a truncated 2008 race season - I got a jump start on '09. I'm pretty sure that, as of this month, I've already completed the same number of races I did in 2008 - total. In hopes of catching up this blog, I'm going to go bullet format - detailing highlights, low lights, and any other random snippets that stick out. Thanks to my new blackberry, many of these things were captured in digital image... to be added. So, here we go - from February until now. I'll try to enter "breaks" for coffee or bathroom trips... and yes, I should number these events since you'll probably have to read this in chapters. *To anyone who participated / traveled with me / remembers these events... PLEASE comment, because I know I've forgotten lots. A very fun weekend with Dad & Team Greenville - We both swam (he swam much faster), we raced on the same relay a few times (thankfully he's not too competitive - because there's no way I would have been the chosen freestyler), I still can't figure out how to swim a 200 free, the scar on my shoulder served as a good excuse for my less than stellar times (at these meets I am a poser-swimmer... I can try and look the part, but my event results pretty much give me away). Now, fellow meet participants look at the scar - and figure it was a swim yardage induced rotator cuff injury. Little do they know, my times were only seconds off last year's results... pre surgery. Valentine's Day (I figured forcing myself to run 13.1 miles as hard as possible might be the perfect way to celebrate such a Holiday). 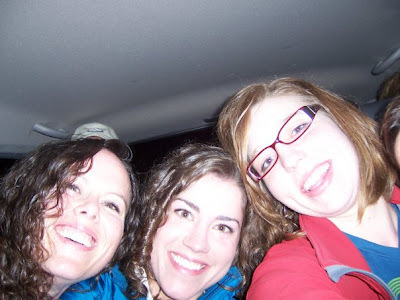 Good trip with Sarah, Nicole, and Jeff... 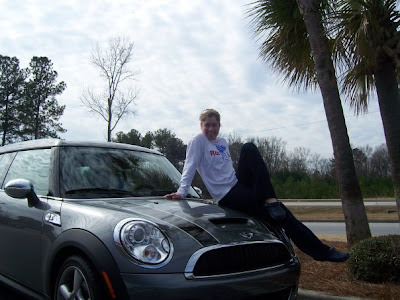 I was the designated driver - primarily because I LOVE to drive, I LOVE to drive the Mini, I drive stick shift, and Jeff (Mini owner) had worked the night shift right before we left. 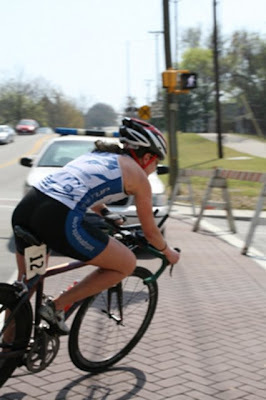 This race was important - mentally - because I knew I'd be cut open (clavicle surgery #2) upon returning to Greenville. I wanted to go under the knife with run satisfaction... prepping for a speedy return to 100%. Luckily, it was just that - a Great race! I loved running that day. Many friends from G'ville posted PR's. Kristi, Jenny, and I waiting for awards. Phew... Reedy River is a big one for the G'ville running community. 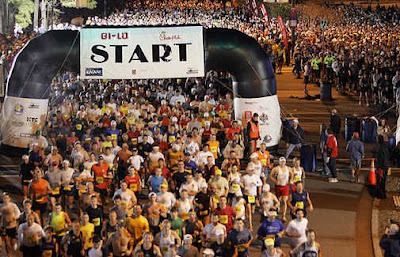 This year marked the 32 running of the RR 10K. We had people from all over vying for the prize $. Overall male winner, Blake Boldon, made the journey from Colorado Springs - and the female champ had a resume boasting a nice finish at the Marathon Olympic Trials. 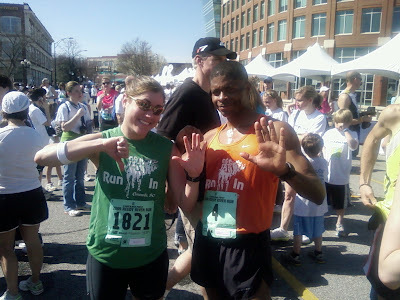 Although we were running around Greenville, almost along my typical training route, the race had a "big feel." I was very excited to crack the top 10... actually placing 6th... but, while walking around near the finish, someone said, "awe too bad - the money only goes 5 deep." Not that I expected to be near the top finishers (a mental hang up, I know.. but, I did not grow up running. I was a gymnast/cheerleader. I line up at the start, see all the "real runners" around me, and try to do as they do)... but, when I realized I'd only been about 10 seconds from making some coin, I couldn't help but feel slightly bummed. Just then I ran into OJ, a friend who happened to finish in the 6th slot for males. HA. We took this picture to document our 6th place, one away from pay. It was COLD. I think it was raining too.. but, I was numb - I couldn't feel much. Thank you Dana for the gloves, you saved my fingers. The swim was in the military training pool (over 80 degrees), so that was all fine and good. But, THEN you had to get out of the water and hop on your bike, and try to pedal while your muscles retracted into a state of shock. I don't think my quads every really showed up for the party. My run went well - only because I was trying to avoid hypothermia and FINISH... and find warm clothes! Kimberley had a great 1st place finish - while I gratefully accepted a smaller eagle for my efforts. Awesome way to kick off the 2009 tri season. *Thanks to my [former] Marine friends for a fantastic weekend on Parris Island! I got to stay Saturday night with the Max Motivation Bootcamp instructors... just sitting with them, drinking beer, and hearing the guys recount their bootcamp stories was a night I'll never forget. ~KW emailed me many finish pictures... but, here's the deal: I don't look good while racing, I look even worse at the finish, and at Parris Island... I found a new low... racing, finishing, while 1/2 frozen. NOT a good look - but thanks K! Here's a theme you'll find in upcoming race reports... I spent most of the race chasing after Ms. Kat Welling. One cool thing about the bike course: it makes you feel like a cyclist! Almost crit style bike racing around the downtown area (which is why I'd decided to take the road bike). Lots of turns, lots of hills, lots of cars & people. The flight of stairs found on the run course was an interesting surprise. OH, and I almost forgot - the race started at 1:00 PM. 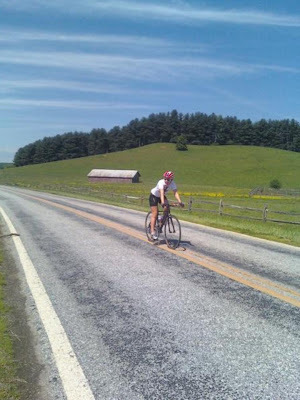 I stayed at home, got to sleep in on a Saturday, ate breakfast, packed up the tri gear, and drove to Columbia with plenty of time to get my packet, set everything up, and warm up by riding the course. Jeremey, if you're reading this... I know it wasn't your favorite schedule of events... but, Please keep the late start for 2010! Also, thanks Troy for the great pictures. OUCH - 5K's hurt, they hurt bad. I suppose it was a "hurts so good" kind of pain... but, I'd much rather do a sprint distance tri than a straight up 5K road race. Dana did a great job organizing the event, Set Up did the timing, and I got to suffer through 3.1 miles with some fast friends. Sam Inman and I battled it out most of the way... but, he found faster feet as we neared the finish. This 5K reminded me why I participate in and train for races. Every time I turned around, I ran into another running buddy... everyone out for a little speed work. It's a diverse group, the athletes I've become friends with here in Greenville, but I truly value each person I've grown to know. - Nicole's supersonic driving abilities. - Our rendition of "Gangsta's Paradise"
- Arriving to the hotel and realizing I'd forgotten the skewer for my front wheel... then, finding out that Andrew Starykowicz had an extra I could borrow. 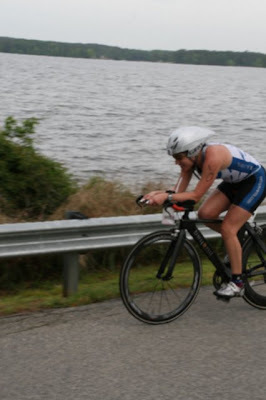 AH, of all the things needed to complete a triathlon - a small rod of metal could have kept me out of the race! Thanks AStar! - Thea finally making it (via plane) from Greenville. - The most active day-before-a-race I've ever experienced. I think the mini made 3 or 4 round trips from hotel to race site. We swam in the ocean (aka: tried to make our way from buoy to buoy in the waves), walked around the expo, waited in line for our packets, checked our bikes in, shopped, had lunch at a cute cafe, did a short run, cleaned up, had dinner with some guy named Andy Potts, finally got back to the hotel around 8:00, packed our race bags, painted our toenails, and went to sleep. I was spent. - Waking on race morning to Thea telling us what she'd seen outside our window... it's not G-rated, not even PG 13. It involves a guy, a girl, and a hotel hot tub. I took it as a good race omen, why not?! - That's when we saw the ocean - and the whitecaps. - After lots of fret, Thea threatening to pull herself out, seriously worrying (to myself, a person pretty comfortable in most water)... the officials made the call: only Pros would swim. The rest of us would bike-run, starting in numerical order. Thea and I were in the amateur elite division, so we went off almost 2 hours before Nicole (who basically had time to nap and eat breakfast round 2.... but, even after a late start won a cool Age Group award!). - Great race. Smokin' fast course. Props to all race organizers/volunteers for quickly pulling plan B together. - My mom won her Age Group by 7 minutes. Yes, she is the 55-59 yr old Female STUD. - We acted like slugs the rest of the day... but, finally got motivated for dinner that night. We went back downtown, ordered drinks, and enjoyed a plethora of tapas. Alright, he knew we were taking this one! 8. Training with Gail Kattouf - all around the Upstate. 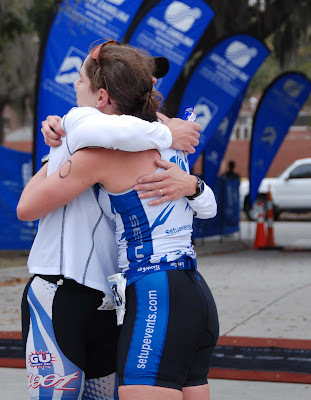 This isn't about an official race... but often, after training with Gail, I feel as though I've suffered through a race. We have fun, talk about everything, sweat, push hard, laugh, and always end up having a better workout thanks to the other person. I chase her gazelle-like stride around the track until I feel like I might puke. We sit on bike trainers and move our mouths about as much as we move our legs. Our rides have been an adventure each and every time we saddle up. We road over Caesar's Head to Bevard... while her derailleur malfunctioned the entire time, leaving us to call her parents to come pick us up roadside, and drive us all the way back to G'ville. We've stopped to take pictures of llamas, ourselves, gorgeous scenery, etc... We've climbed Paris Mtn over, and over, and over again. Sometimes we jog along the Swamp Rabbit Trail at a pace slower than a fast walk - other times we haul booty on the same path. Through these training sessions, I've learned 2 very unknown things about Gail: 1) she can talk to animals; most notably, horses. 2) she has the most uncanny ability to plan a long route, look at a map, memorize the turns/road names, and direct us along that route without a hitch. No joke, it's borderline spooky. Most importantly, we make training fun. It was an early morning getting to Lake Murray - but, I arrived to find a fun group. As is typical of the Set Up Events triathlons... everyone had their own pre-race routine, but we joked around while getting prepared. 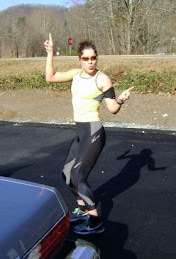 Troy has some good blackmail pictures of me shimming into my wetsuit. Things were pretty relaxed until the second the gun went off. The people I train and race with - well, they show up to race - and I wouldn't want it any other way. The ladies in this area are such great competitors! Kat lead the field out of the water (in typical form - large margin) before Gail laid the hammer down once on her bike. Everyone raced well, and the rest of the morning was spent eating burritos, sitting in the sun, and collecting our awards (Shamwow's). Franklin is an athlete's playground. The roads are a dream come true - rolling through the valley for running, or climbing around the mountains for cycling. To top it off, there is a beautiful lake about 10 miles from my parent's place. My parents, being the amazing / supportive / athletic people they are, seem to understand my crazy mountain endeavors. During my last trip to Franklin: dad drove mom and I to the lake, he paddled the kyack next to me while I swam, I changed into running clothes, then my parents drove back to the cabin. I wanted to run back from the lake... up and over the mountain. It wasn't an easy run, but the thing about point-to-point runs is this: you have no choice but to keep moving forward. It ended up being an Epic day of training... with the most amazing finish - my dad had installed an outdoor shower on the back of the cabin. After a long lake swim, and a long run home, standing under a stream of water (while still in running clothes), is pure bliss. I'd love to write a long post about FUN times in Myrtle Beach - the race and surrounding festivities were a BLAST. A recap of last weekend is coming, I promise. and what's the first thing the nurse asks for?! A urine sample - yeah right. It took me 30 min. - I'm not good with needles (ok, that's putting it lightly)... so, it took her some "prodding" to get an IV going. Once it was in - I had some kind of reaction (you med people know what I'm talking about, starts with a V?). Anyway, the room began closing in - hearing went funny - next thing I know, I wake up with wet washcloths all over my face. I hadn't even had surgery yet. 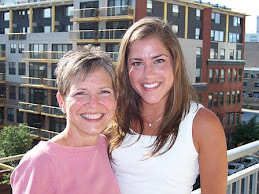 Mom: thank you for being there with me, and holding my hand. They ask you to mark the "removal site"
is an atypical member of the cat family (Felidae) that is unique in its speed, while lacking climbing abilities. It is the fastest land animal, reaching speeds between 112 and 120 km/h (70 and 75 mph) in short bursts covering distances up to 460 m (1,500 ft), and has the ability to accelerate from 0 to 110 km/h (68 mph) in three seconds, faster than most super cars. 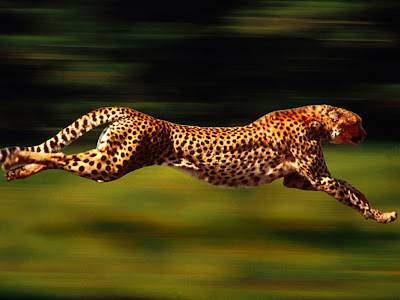 This means my friend/co-worker, Becca, and the Cheetah have something in common: SPEED. Paired with her super-sonic running ability, the girl's got an eye for style. 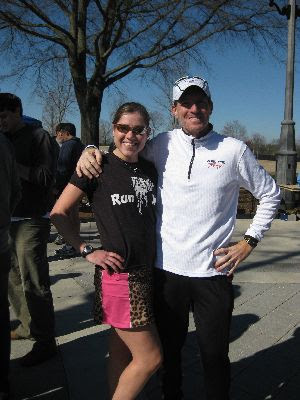 As a fan of the running skirt, she found one online in cheetah print. And, at the Greenville News 5K - Becca did the Cheetah proud! The fem feline FLEW to a fantastic win. And, who did she run down the finish stretch with? The G-man himself. 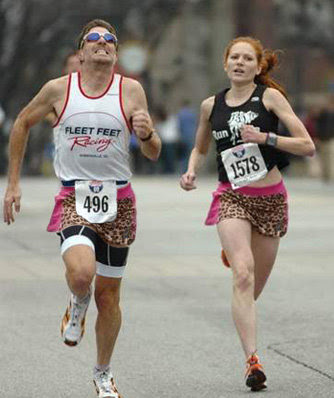 I think the Cheetah skirt was just the fuel G needed to hunt her down in the closing strides. Since that race - and Becca's "Cheetah Girl" picture in the paper - the skirt has become famous in our little running community. Well, last weekend was the Green Valley Road Race - and Becca was in Colorado. So, the Cheetah was left in my care. I had many requests to race in it... but, I'm no Cheetah. I don't think I could do it justice. The morning started out very early... I had to take my parents to the airport. So, at 4:45 I was knocking on their door, taxi service ready! An easy ride to and from GSP airport - then a long wait for an 8:45 race start. What to do? Have a bowl of oatmeal, play on the internet (thank you facebook), look at the weather report, listen to music... I have never had that much time the morning of a race. At 7:50 I headed over to Gail and Rick Kattouf's house. Rick was headed out the door to make his way over for the 8K (8:30 start). I met up with Gail, and we jogged across the street to Furman University. The morning was perfect for running - really, we couldn't have had better weather. The sun was out, already nearing 50 degrees, and hundreds of people were ready to run! I got my race number, talked with friends, watched the 8K start - then Gail and I made our way to the 10 mile start. We had both been planning to wear long sleeves and gloves... but ditched those near a tree. Shorts and short sleeves, wooHOO! Being at the start was like being amongst friends going for a group run... everywhere I looked, I saw another running buddy! Joe, Rich, Kimberley, Juergen, Beth, Sam, G'man - what a fun group! Before I knew it, we were off. Road race starts get me every time - so different than a triathlon. A heard of footsteps unleashed... I tried to control the first mile, but seemed to be caught up in the race energy. Immediately, I saw a few girls just ahead of me (Gail was already further ahead, with the lead guys). We tore through the Furman Mall - only flat 1/2 mile stretch on this course and headed for the hills! Kerri's loud cheering made me smile as we exited the campus gates. I know this course well... as I've said, Furman is an athlete's dream playground. A constant influx of runners and cyclists meeting for play dates. 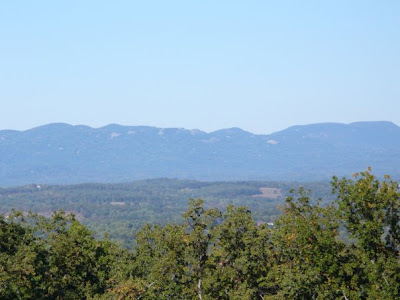 With it's proximity to Paris mountain and scenic roads, what more could you want? I actually found myself smiling - looking across the fields, and seeing blue skies, and people running ahead of me. Around mile 5, I heard a volunteer say, "2nd Girl". Knowing Gail was in front, I got excited knowing she was the only female ahead of me. Well, the smile lasted until around mile 7. That's when the blister from H#%$ formed on my right heel. I'd raced in the shoes 6 times already - no problems. For some reason, they chose mile 7 of the GVRR to rub a HOLE in my heel. I clenched my jaw and forged on. Down, through Traveler's Rest, UP past the baseball field... and then I felt it POP. I knew the shoe was going to be bloody, but I didn't expect to feel a squish with each right step. Niiiiiiice. Well, at least it took my mind off the pain in my quads/calves! We were getting close, about 2 miles to go. At this point, you're going down a false flat... usually, this is a "speed up to the finish" kind of course. Notsomuch for me on Saturday - pesky headwind had other plans. Head down, screaming blister, begging for a finish line. Going down the final hill (back into campus), I see my friend Juergen come up on my left! Claiming this was a "long temp run" in prep for the Myrtle Beach Marathon - I couldn't believe how easily he swept by my side. This turned out to be just the boost I needed. About .75 miles to the finish - and Juergen was pulling me in. I remember his words, "come on Ashley, we're almost there... fight up this hill... strong, you're strong." We dashed back down the mall area (again, only flat) - and in true "gentleman" form, Juergen stepped aside and let me cross just ahead. Hey Juergen, don't be so nice in Myrtle Beach!! 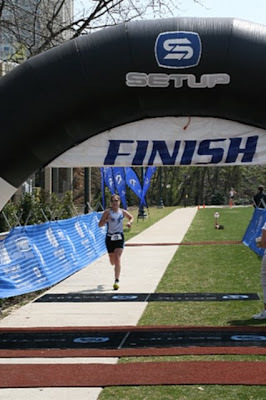 It was not an easy race - actually, it was much tougher than I'd expected it to feel. That being said, I LOVED it. I loved the course, the athletes, the weather, the speed. It was a good day... and I quickly found Gail and Rick. Gail had been the 1st female, and I came in many people behind her - 2nd female. I think it was the 6th or 7th time she's won this race! 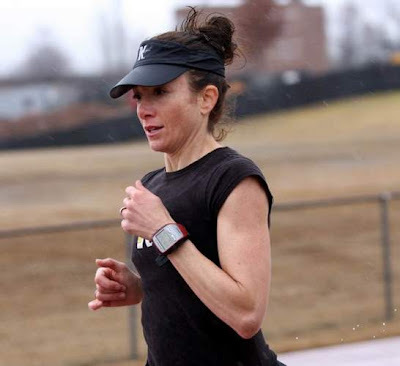 Gail actually holds the course record - set when she was 18, running for Furman. We made our way back to the clothes we'd stashed near the start. As we were putting them back on, the Furman baseball coach approached us. He said, "hey, what's going on.... there's clothes all over the place." Gail said, "oh, the Green Valley Road Race." I had to chime in, "yeah, a bunch of runners showed up this morning - and we decided to go streaking through campus." Coach laughed and shook his head... "crazy runners." So, I'd taken the Cheetah with me to the race. Really, I think only Becca can pull the skirt off during a race - but, I wasn't afraid to put it on for awards! Luckily G'man and Janis were there to capture my catwalk on film. Maybe you've been there too? 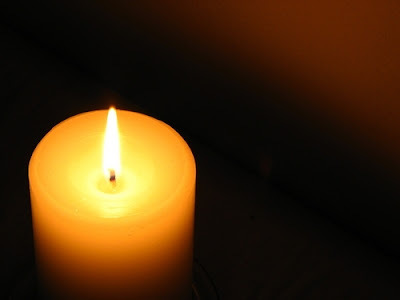 When your flame goes out... sometimes the wick slowly burns down, other times it's quickly extinguished. Either way, you're left to rebuild the fire. That's where I find myself right now. It has been a long process - 1st trying to find the match, and then creating the spark. Last year's bike crash, and subsequent surgery changed my life. I'm sure I'll find myself discussing many of these things in posts to come. 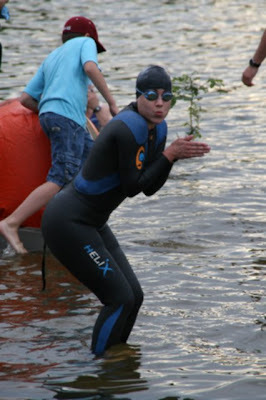 But, with each good day of training, warming temperatures, alongside fun friends, racing... I can feel it all coming back. 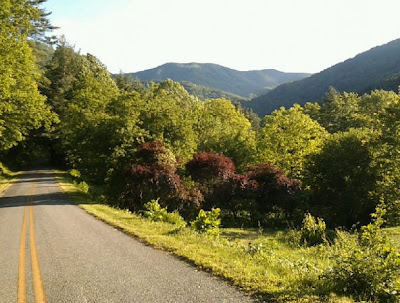 - Running the Art Lobe Trail (North Carolina - Blue Ridge Pky area) on New Years Day. - The Sunbelt Masters Swim Meet (with Dad in Charlotte). - The Green Valley 10 Mile Road Race. 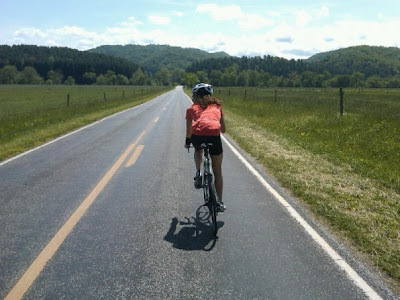 - Riding with G and Amy in 70 degree temps on Sunday. 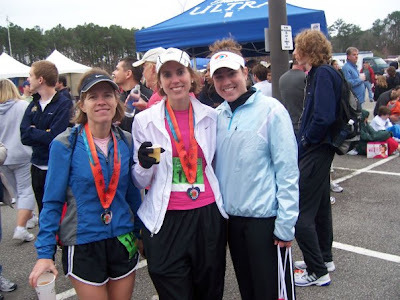 - Myrtle Beach 1/2 marathon this coming weekend. - Surgery #2 on Monday (just to take out some "bands" that were holding the bone). Really... I'm going to get back to blogging slowly. I can't overwhelm myself with a marathon post. Pacing, it's all about pacing. So, with this note - I relight my fire. I planned on meeting my friend, Amy, at the GHS track around 7:30 (we were both running there from separate places, as a warm-up). So, I get to the track and see Amy doing S-T-R-I-D-E-S... girl was striding OUT. We had laughs about her bounding around the lane. It felt good to be on a track again.... it has been months. I was scared to even use a stopwatch. After the Green Valley Road Race this past weekend (10 VERY tough miles - up and down and up and down).. my legs were still not quite recovered. But, I made through a workout. Training with Amy has proven to make me laugh.... but, this morning was extra special. Because she made the mistake of letting me pick the cool down route. I decided I wanted to go home via the shortest way (2 miles). This requires running through the GHS parking lot. NOT the place you want to be 10 min before classes start. So, Amy and I take off into the lot, now known as DEATH ZONE. I was almost hit by 6 cars, count them 6 CARS. Oh yeah, I also almost ran into a car door as it was flung open. Pretty sure another HS student ran a red light and almost took me out... after we had made it through the GHS Speedway. I honestly didn't know if I was going to make it back to the house in one piece. Amy sent a text just to make sure. I've found some of the best friends - friends who'll risk their life in a HS parking lot, 10 minutes before the bell, to run by your side. 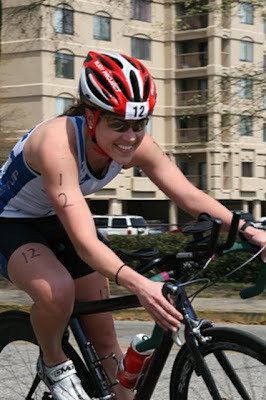 Cheerleader turned Triathlete. DAWG fan for life! Up for almost anything, especially if it's done outdoors.